The diving caddis, a wet fly that represents a caddis fly in the process of laying its eggs. I'm not certain who is the creator of this pattern but I have seen it tied by Mark Libertone. The materials consist of olive thread, green embroidery thread, gold tinsel for the rib, hares mask for the dubbing, and partridge for the hackle. I had a request to show my fly box. Here is the one I always carry. The selection as you see it is there for one reason "these flies work" I'm not afraid to fish these flies at any time of year. One of these days I'll get it in some kind of order...........I also carry a smaller box with my "go to best flies" which shall remain secret. One And Done...a beautiful day. Yesterday we had a nice little thaw going on, so Kirk and I joined forces to see if we could encounter a few willing trout to grace us by accepting our offerings. The weather was clearing when we arrived and the sun was making the air very enjoyable. The stream having accepted the melting snows did not in the least look off color but was bright and clear, as if the trout needed more clarity to know we were out and about. This was the first pool I fished. The water runs fast and as it nears the large stone it creates a deep holding pool. The spot almost always give up a strike at least, and most times a brown trout. On the third cast, the fist two don't count 'cause they hit the stick that the "trout faeries" placed there. As the fly settled and I gave it a brief twitch I felt the strike. I lifted the rod and suddenly this fish rockets out of the water and proceeded to give his best to try to win the battle about to happen. With cold water these fish seem stronger and after the 2 runs he decided to surrender. 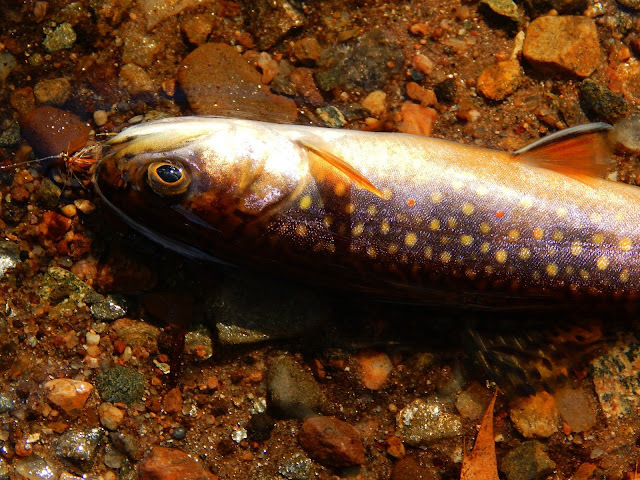 When I hooked the fish I knew it was a trout, most likely a brown, but at hand I was so pleasantly surprised to see a beautiful brook trout. I have not caught a brookie in this area for a good year and I was delighted to see them coming back. The fly....this was used for most of the outing and accounted for all of the fish, which is one. I mixed in a few dries and wets but the only fish of the day was a brook trout taken on the third cast. Kirk was also a one fish angler, he took a handsome brown trout further up the stream. As we walked back to our cars we decided to go and have a coffee and talk about a successful day. Another Connecticut stream that flows near a red barn. A beautiful stream with lots of interesting pools and an abundance of wind blown timber. It flows through a very steep ravine and it can be a challenge and caution is required. 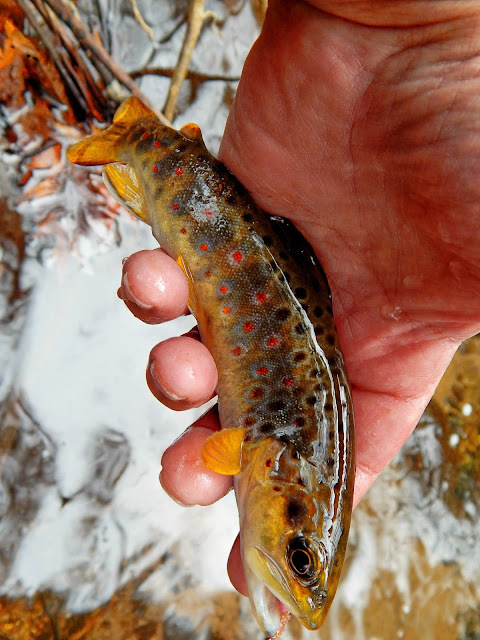 The stream holds wild brown and brook trout, and in the fall takes on some very large brown trout migrating up the little stream in search of spawning area. My luck in this stream has been with brook trout, I think I have only taken one brown. I tend to fish these waters in the spring, and I don't know why for the area has to be awesome as the leaves turn. I've given this stream the name "Tumbledown Brook", and there are parts of it that you'll do just that. The stream is well shaded and runs cool. One other inhabitant of the area is the black snake and water snake. Man I've seen a few beauts. The true reason for fishing here are the brook trout. As you can see they to have a distinct coloration that must have something to do with the water they live in. They also love to rise to the dry fly. This wild one has a yellow wing bomber in the corner of its mouth. As I look at the calendar I see I have only a couple of months to wait until I pass the red barn on the way to "Tumbledown"
Mark Libertones "Cream Soft Hackle"
This is a fly created by Mark Libertone of New York. It represents a sulphur or light cahill mayfly. These flies come off on various northeast streams from May through July. Trout really enjoy this hatch and will take these flies readily. This soft-hackle is simple and elegant, and represents that phase of emerger that gets hung-up in the surface film or perhaps a drowned spinner. 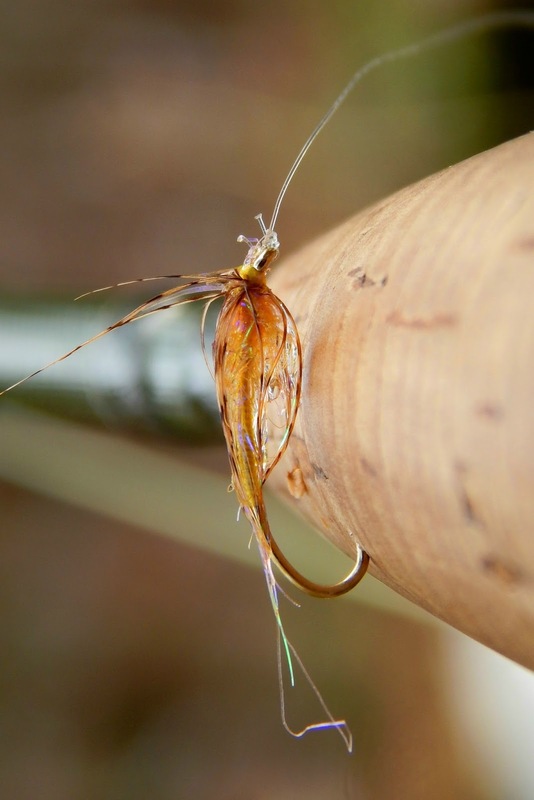 The recipe for the "Cream Soft Hackle" is Dry fly hook,.. Body, Ecru Embroidery Thread...Thorax, Light Cahill Hares Ear...Hackle, Pale Ginger or Cream. We paid a visit to the Fly Fishing Show yesterday in Marlboro MA. It was a good few hours seeing some of the new and "must haves" for 2016. I saw some old friends and met a few new ones. I was good as far as making purchases, some scissors, dubbing, and a nice find in some hackle. This beautiful straw-badger hen cape was in pristine condition. A fly using the badger hackle..caddis maybe? It's supposed to snow today but as of yet not a flake has fallen and that's OK by me. Be well friends. Winter fishing can be so unpredictable, "predictable" it's almost so hard to explain. We fished a stream yesterday, the same one I fished Sunday. Both days were sunny and bright but that's where the similarities end. The days since Sunday have been colder and each day a strong wind was present. The stream had its stones exposed and were laced with ice, pretty from a distance but dangerous. Fly selection would be easy and presentation not a worry, the key would be to keep it near the bottom and fish it slow. I was a bit surprised when the fly I was fishing took a strike not more than 18" from where I was standing. The brown was on briefly but swam away rapidly. We moved along fishing likely areas where the trout would be found. The wind picked up and the ice was forming on the guides. I suggested we take a break and visit a store and warm up with a cup of coffee...man that was good. Fishing for about another hour or so I did manage to get a nice brown to take my offering. Bringing a fish to hand in winter is so rewarding. We came to that point when fishing was not what we had hoped it would be this day and we packed it in. Spirited wild brown...look at that tail. Driving home my thoughts were of a crock pot venison stew I had made the day before. When I got home the first thing I did was heat it up and enjoy some internal comfort and joy at the end of this January day. As I enjoy my first cup of coffee this morning I'm saying to myself "glad I was able to get out yesterday an fish", for it's windy and cold and snowing. Yesterday was a bleak day, typical January I guess. As I pulled off the paved road to park I had some thoughts on what I wanted to take place this day. Catching fish was one of them but not the only reason. I was here to check out the "outback" or maybe a better name would be the "upper outback". I was geared to walk some so I chose to leave the waders in the car and instead chose hiking boots, a lot more comfortable. I started walking in through the woods and found numerous little streams, they were all running scantly but so very clear. As I neared the stream I found it to be in fantastic shape and anticipation of a fine day came forward. I had visited this section of stream only once, that coming in this past summer so I knew the area a bit but not much about the trout I had hoped would be there. I came to a nice run that held some deeper pockets and tossed out "pinkie" because that's what I had on from my last outing. I tie my "pinkies" without weight and that was not helping me to get the fly down. I changed to a bead-head fly and that was just what I needed, or should I say what the fish needed. There were some surprisingly deep holes along this stretch. And a few of them held willing trout. My first fish of the day. A stunning wild brown. His orange spots so brilliant....wish I could have seen him in sunlight. And he was also very acrobatic. The stream was very generous, giving many strikes, and some hookups. Behind the boulder is a eddy with lots of swirling water. I had a nice fish on be it so briefly...I'll remember to hit that spot again. This brown was some what pale in comparison to the others....the parr marks and adipose fin really stand out though. This is a little stream Kirk and I fished yesterday. I have written many a post involving this stream, it's my home water. The stream is home to both wild brook and brown trout and in some years the rare wild tiger trout. The tiger is a cross between the brook and brown. At spawning time there's a little fooling around and the result is the tiger. The tiger is sterile and cannot reproduce hence the rarity. Tigers are a extremely aggressive trout. They strike the fly like no other fish and battle beyond belief. What brought me to do this post is that yesterday while fishing this stream Kirk hooked what may have been a wild tiger. I did not see the entire battle but saw enough to think it was not an average brookie. Unfortunately Kirk was unable to gain control of the fish and it slipped the hook. Now what I can show you is this tiger I caught in this stream back in December of 2011. And in May of 2012 in the same stream I caught this tiger. He had moved much further upstream and had grown considerably..I think it's the same tiger. The stream I have been talking about sends it's waters to another small stream, it to has a combination of brook and brown trout. These are all wild fish, there's no stocking in either stream. In the outback section of the stream while my streamer drifted near the undercut bank I felt the vicious take of a trout. I battled this fish for some time. I saw him roll and thought I had a beautiful brown. When the fish finally gave in and drifted along the bank I could not believe I had taken another tiger. 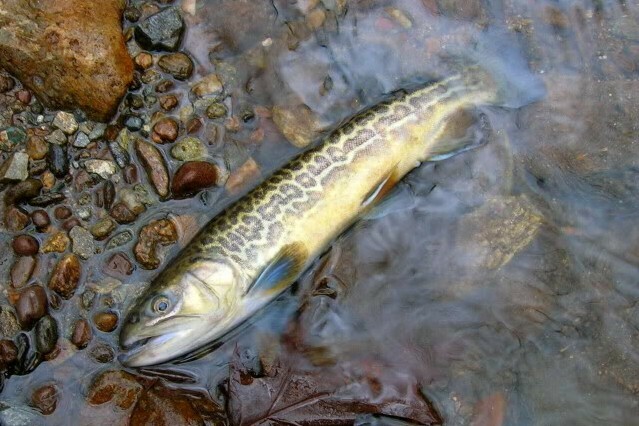 The normal vermiculations of a male brook trout seem to be enlarged and contorted into stripes (hence the "tiger" moniker), swirls, spots, and rings. Every one that I've seen also has a greenish cast, which lets you know that there is something different on the end of your line long before the fish is in hand. Mondays outing was an enjoyable one. Sundays heavy rains and mild temps cleared the ice from the stream and brought levels up nicely. Another one of the pleasures of small streams is their ability to recover from high off color water to very clear and very fishable water. The air was pleasant, sunny and clear but temps did start to drop and ice was noticed in the guides. I started fishing a dry fly, reason being I have not taken a trout on the dry in '16 and I felt this day was a good day to get on the board. It was many casts and several locations before I had a brookie rise. Several more came to the fly and missed. With the few fish that rose it would be all that I needed to stay with it...but I didn't. I changed to a soft-hackle and that proved to be the right choice. These trout were actively feeding and were willing to come up, so the subsurface fly made it easier. The pool just before the falls held several brook trout. As the fly landed and drifted towards the tail out one of the brookies made a fast break for the fly. There was a very spirited battle but soon the jewel was at hand. Photographed and released off it went. A third cast brought another strike and another trout to hand. These brook trout were hungry and aggressive...not to mention absolutely beautiful. Fishing along this stream brought quite a few brookies to hand. These are a couple of flies that got the attention. After that outing it was back to winter, we shall see what tomorrow brings. The fly represents the little stone flies you see along the stream edges on rocks and in the air. In Swarbrick's description he states the a body of red silk, but most of the patterns are tied using orange silk and this is how I tied the fly. The "Winter Brown"....Fine wire #14 hook, Pearsall's Orange Silk body, brown back feather from a partridge, peacock herl head. The look of this fly is some what different when wet and is pretty effective as you will see in my next post. Last week presented me the opportunity to fish a couple of times. On one of those outings I had the company of Jeanette, who is a good companion and one who will not let me take a stupid risk like walking on thin ice. The stream had been socked in with ice due to some very cold weather. Along the way I found several good looking spots where open water was found and in a few of those spots I found willing brook trout. The air temps were in the upper thirties and when the sun hit your back it felt much warmer. I dipped the stream thermometer into the water and it read 33 degrees. Fly selection was not an issue, a Picket Pin or a bead head worked well. I was surprised by the strikes I received and the amount of willing fish moving. When water is cold like this the clarity is unreal. 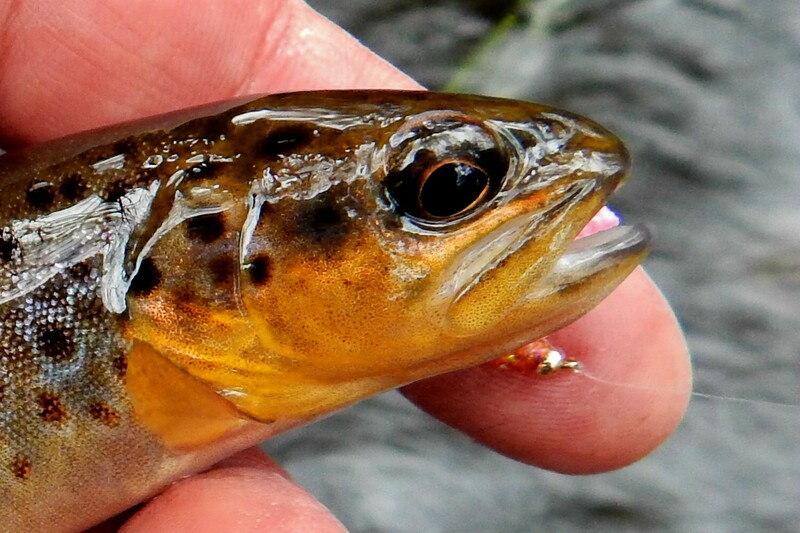 To see these brookies dart for the fly in such a spirited fashion pleasure enough. We met this lovey lady along the trail. Stopping for a while and talking to her master who informed me the lady's name was "Maggie"..such a sweet rescue dog as you'll ever want to meet. Just because it's winter doesn't mean you can't enjoy a lovely stream side lunch. There were places I was able to hook a trout and be able to bring it to hand without sliding on the ice. Winter rewards come in many ways, and a wild brook trout is probably near the top of the list. North Country Fly...How I love Simplicity. North Country Flies are some of the most simplistic, realistic impressions of actual insects ever created. The fly in the photo shows what appears to be some feathers on a hook and not much else, this is true. It's so simply tied and when placed in the stream it takes on the life of something trout actually see. A hook, thread body tied in a fashion to create a rib, scant dubbing for a thorax consisting of squirrel and ice dub., a turn or two of partridge hackle and it's done. When the fly is placed in the stream that's when the realistic aspects of the fly takes place. The movement of hackles, and when allowed to sit motionless in the current the fly will also look alive. Translucent is a key. The little bit of dubbing with one or two ice dub fibers glimmering form a life like body. It's no wonder this style of fly has been around for hundreds of years. I can't wait until the time comes when I can drift these flies again.